Eight years after he was treated like a villain in Cleveland, LeBron James was welcomed back properly. 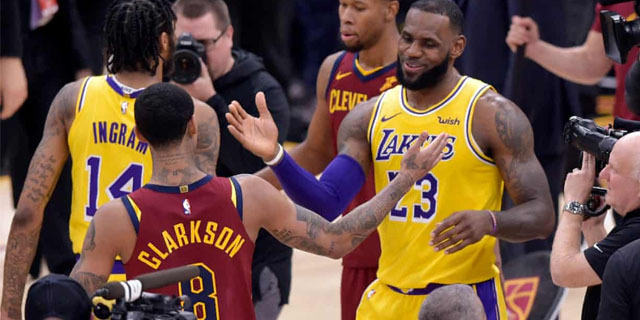 Back on the court where he performed for 11 seasons, and under the title banner he helped raise, James returned to Cleveland and rallied the Los Angeles Lakers to a 109-105 win on Wednesday night over the Cavaliers, who played their best game of the season against their former teammate but couldn’t stop him when it mattered most. James finished with 32 points, 14 rebounds and seven assists. He also scored or assisted on 11 straight points as the Lakers overcame a 99-91 deficit in the fourth quarter. But basketball took a backseat to James’s homecoming, which was so different than his return in 2010, when Cleveland fans unleashed their fury on him after he had left the team to play for the Miami Heat. There were no profane chants this time. No derogatory signs. No venom. Only love, and James felt it. James was saluted by the Cavs with a video tribute during a timeout in the first quarter. James was touched by the presentation. He bit his lower lip while walking back onto court and pointed to all corners of the building in appreciation, his chance to reconnect with a fan base he’ll always share a special, if not complicated, relationship. Elsewhere, two of the teams expected to challenge for the title in the postseason continue to struggle. The Warriors lost their fourth game in a row and their sixth in the last 10 while the Celtics lost to one of the worst teams in the league, the New York Knicks. The Warriors’ played without Draymond Green and Stephen Curry in their loss to the Oklahoma City Thunder but are expected to find their form again once Curry returns in the coming weeks.